Welcome to a brand new feature on the SCFC2 website, where each month we choose the SCFC2 Swans Player of the Month Award based on the Man of the Match votes that you cast each time the Swans play. We’ve got out our calculators and have now totted up all of the votes cast for our SCFC2 Man of the Match Awards for August 2015 – which includes the games against Chelsea, Newcastle United, Sunderland, York City and Manchester United. Drumroll…. 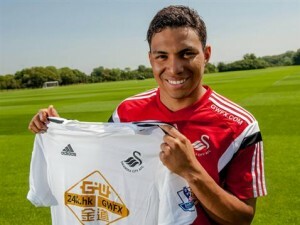 the SCFC2 Swans Player of the Month for August 2015 is Jefferson Montero with 27 of the votes cast. It was a close run thing mind you, with Andre Ayew hot on his heels with 18%, closely followed by Jonjo Shelvey with 15% of the votes. In fairness to Montero, he has received rave reviews after his annihilation of Chelsea’s usually solid right-back Branislav Ivanovic on the opening weekend of the season, followed by Newcastle’s Dutch defender Daryl Janmaat – who saw red in his attempts to collar the speedy Ecuadorian winger. It is easy to see why the quiet Montero has earned the nickname of the “silent assassin” from his team mates. Such has been his early season form, it begs the questions as to whether the big clubs will come knocking in the January transfer window – IF Montero can maintain his form and fitness over the next few months. Only time will tell, but at the moment, I’m sure that everyone will just be happy to see him “run down the wing, when Swansea sing”!